Connecticut School of Broadcasting/Atlanta graduate Chad Potier, was just recently hired as a full time Sports Anchor/Reporter and Talk Show Producer for WYAY News Radio. “Chad developed his talent by relentlessly practicing, networking, and constantly seizing opportunities. Chad Potier needed a leg-up from his full-time furniture sales job. He knew that broadcasting was for him and enrolled at the Connecticut School of Broadcasting’s Atlanta Campus. Director Stacy Green says Chad is one of the hardest workers he knows, “Chad developed his talent by relentlessly practicing, networking, and constantly seizing opportunities. 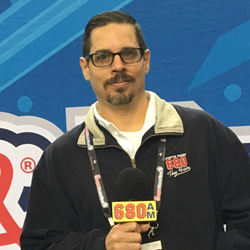 As an intern for Beasley Broadcast Group’s WAEC-LOVE 860, Chad had the rare chance to be on the air reporting news, weather, sports, and traffic. In just a year, he worked his way up to a full-time position as Operations Manager, while taking a job with Dickey Broadcasting Company’s 680 the Fan concurrently”. Chad has excelled, again! Today he is a Sports Anchor/Reporter and Talk Show Producer for Cumulus Media’s, Atlanta’s WYAY News Radio 106.7. He’s also an On-Air Host/Producer for 680 The Fan's Friday Night High School Football and Producer of “The Smooth Draws” Radio Show Saturdays from 10 until Noon on 1230 The Fan2. But that’s not his biggest achievement. He also transformed his life by getting married to Renee and welcoming son AJ to the world, the day before starting his very first paid radio gig! He is always quick to thank Connecticut School of Broadcasting’s Atlanta campus for changing his life, “I went from a dead end job selling furniture, to a rewarding and challenging career in the 7th largest radio market in the U.S. I learned on the same equipment that I use everyday and was taught by people I work with now everyday. It’s amazing.” The Connecticut School of Broadcasting is the Nation’s largest group of Broadcast Media Schools with campus locations in CT, MA, NJ, NY, NC, GA and FL.